Liz Knowles is a fiddle player in a constant search for inspiring music that does not necessarily adhere to categories of genres or styles. With her foundations in formal classical training, a Bachelor of Arts in Music at SUNY Stony Brook and a host of classical gigs in and around New York City, she soon began playing in rock bands, salsa bands, and a variety of new music projects, performing and/or recording with such artists as jazz pianist Marcus Roberts, pop singer Paula Cole and classical minimalist composer Steve Reich. It was during this fertile exploration that she stumbled on to Irish music. With no career aspirations whatsoever, she followed a strong passion for this music and quickly became one of the only classical violinists to become adept at playing an authentic Irish fiddling style. Her longstanding stint with Ensemble Galilei, an ensemble that performs traditional Irish and Scottish music, Early, Medieval and Renaissance music as well as original compositions, reflects her search for the marriage of her favorite genres of music as well as the opportunity for Liz to further explore her composing and arranging skills. Her tunes and arrangements can be heard on two TelArc recordings, From the Isles to the Courts and Come, Gentle Night as well as a Maggie’s Music recording, A Winter’s Night. Other original tunes and arrangements can be heard on records by John Whelan, Liz Carroll, Cape Breton band Beolach, and the upcoming Flook album. She has arranged several of her tunes for string orchestra and recently performed them with the Metropolis Orchestra in Symphony Center in Chicago, IL for a St. Patrick’s Day celebration concert. 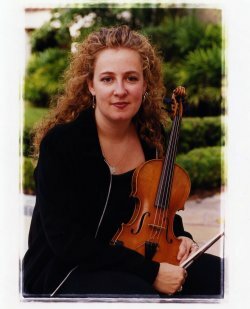 Her career as a fiddler includes a solo spot on the soundtrack of Neil Jordan’s film Michael Collins, a two year run as the soloist with the Irish dance extravaganza Riverdance, performances and a recording as a guest soloist with the Cincinnati Pops Orchestra (Celtic Spectacular, Tel Arc Records), and a year-long stint with Cherish the Ladies. She performed as a member of the highly acclaimed “String Sisters” at the Celtic Connections Festival two years in a row and completed a tour of Norway recently, culminating in a CD and DVD release (soon to be released on Grappa Records). Liz released a solo album on Lyrichord Discs, “The Celtic Fiddle of Liz Knowles” and has recorded and/or performed with various other artists such as piper Kieran O’Hare, fiddler Liz Carroll, guitarist/singer John Doyle, singer David Kincaid, classical violinist Rachel Barton, pop singer Don Henley, and singer/instrumentalist Tim O’Brien. Aside from performing and recording, her skills as a teacher in many capacities are well-known and she is in the process of completing a book bridging the gap between classical music methodologies and the learning of traditional Irish music (as yet untitled).